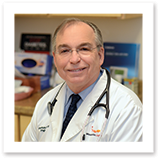 Stephan P. Babirak, PhD, MD has practiced Endocrinology for over 30 years and in Maine for over 20 years. He attended the University of Illinois where he completed his undergraduate degree with honors in 1974 and then completed a Doctorate Degree with a PhD in Physiology and Biophysics in 1980. He earned his MD degree in 1983 from the Chicago Medical School. Dr. Babirak completed his Internal Medicine Residency at Mayo Clinic in Rochester, MN, and did his specialty Fellowship in Metabolism, Endocrinology and Nutrition at the University of Washington in Seattle. Dr. Babirak is a Fellow of the American College of Physicians, a Fellow of the American Heart Association’s Council in Arteriosclerosis and a Fellow in the American College of Endocrinology. In the past, he has been Co-Director of the Diabetes Wellness Clinic, Co-Director of the Lipid Clinic and Assistant Chief of Endocrinology at Wilford Hall USAF, Chief of Endocrinology at Saint Vincent in Erie, PA and Director of the Diabetes Division at Maine Medical Center. He is currently an Associate Professor of Medicine at University of Vermont and Tufts Medical Center. He has been recognized by the American Diabetes Association for over 10 years as a “Provider of Excellence” in diabetes education, treatment and prevention and by the National Committee for Quality Assurance for its Diabetes Recognition Program. This voluntary program is designed to recognize physicians and other clinicians who use evidence-based measures and provide excellent care to their patients. Dr. Babirak’s research work in basic science and clinical trials has been published in numerous journals, including Circulation, Atherosclerosis and Diabetes Care which have been presented at national and international meetings. Currently, he is Board Certified in Internal Medicine and Endocrinology, Diabetes and Metabolism. Dr. Babirak is the President and Medical Director of Metabolic Leader in Scarborough, Maine.